South Korea is a part of East Asia located 6,671 miles away from the United States of America. It’s known for being a technologically advanced country and it’s the home to over 51 million people. Additionally, South Korea is also the home to the Korea Scout Association and this year’s Olympic Games. But Scouting isn’t new to South Korea. 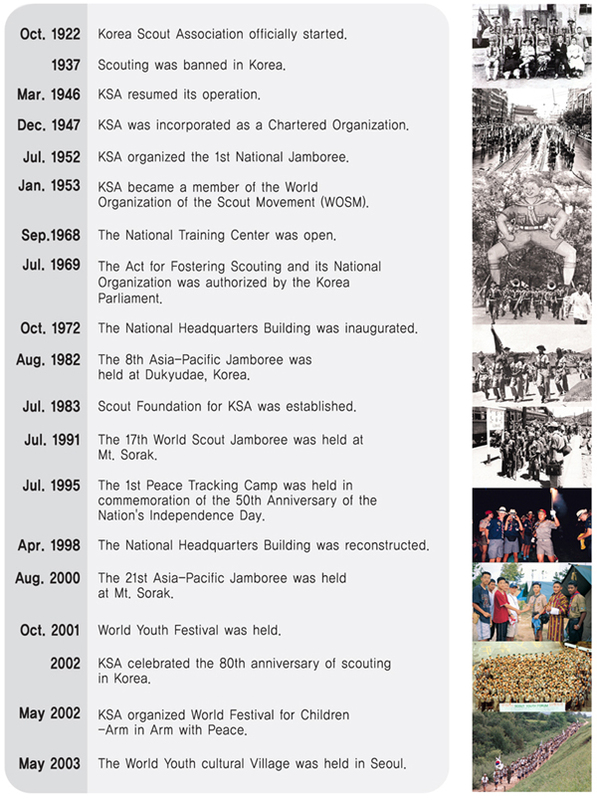 It was introduced 96 years ago in 1922 as The Korea Scout Association (KSA). However, it was banned for a period of eight years from 1937-1945. Just eight years later, it received recognition as a member of the World Organization of the Scout Movement in 1953. As a member of the World Organization of the Scout Movement, Scouting in Korea isn’t much different than it is in the United States. Just like the BSA, KSA is focused on helping young people fulfill their duties to God and country. In addition, KSA enables young people to help other people at all times. Another thing that’s quite similar to BSA is KSA’s Scout Promise Law and Motto. What is the KSA Scout Oath? KSA doesn’t have a Scout Oath, but it has a Scout Promise. To implement my duties to God and my country. To do my best to help others. To obey the Scout Law always. What is the KSA Scout Law? The KSA Scout Law is the same as the BSA Scout Law. What is the KSA Scout Motto? But although both organizations have plenty in common, there are also a few differences between the two. One of the big differences between KSA and BSA is the different rankings in KSA. What age do Scouts start in KSA? Scouts begin at age 4-6 as Beaver Scouts. What are the other levels of Scouting in KSA? Cub Scouts, Scouts & Venture Scouts, Rover Scouts, and Leaders. How do the ranks of Cub Scouts differ in KSA vs BSA? In KSA, 1st and 2nd year Scouts begin their Cub Scout journey as Squirrel Scouts. After their 2nd year, they move on to become Rabbit Scouts. In their 4th year, they move up to be Deer Scouts. Following year four, Cub Scouts earn their Bear Scout. In their 6th and final year, they receive their Rainbow Scout. Are there Eagle Scouts in KSA? No. The highest ranking a Scout can earn in KSA is the rank of Tiger Scout. However, the rankings that precede it are almost all the same as the rankings in the BSA. The rankings Scout earns their Tenderfoot, 2nd Class, 1st Class, and then Star in both KSA and BSA, but the ranking that precedes Tiger Scout is Mugunghwa. Overall, South Korea has served as a home for Scouting. This has allowed Scouting to grow and flourish for the last nine decades. The KSA will celebrate its 100th year of existence in the year 2022. In order to properly celebrate KSA’s birthday, the country will host the 25th World Scout Jamboree in 2023. This will mark the second time that South Korea has hosted the World Scout Jamboree — it served as the host for the 17th World Scout Jamboree in 1991. Scouting is changing lives in the East Asia country and will continue to do so for years to come. In addition to being a home for Scouting, South Korea is also housing one of the biggest world events the city of Pyeongchang — The 2018 Winter Olympics. It is the first time the country has been honored to host the Winter Olympics. The last time South Korea hosted the games was 30 years ago for the 1988 Summer Olympics in Seoul, Korea. It’s also only the seventh time that Asia has been the host of the Olympics — Europe and North America have a combined 43 times. The opening ceremony kicked off with a dazzling array of lights illuminating the night sky, thousands of dancers performing on stage, and of course, the ceremonial lighting of the torch. You can catch all of the highlights of the opening ceremony here. All in all, this great country in East Asia is a home to millions of people, a home to Scouting, and a home to the Olympic Games. What world Scouting experiences have you had? How is Scouting different in your country? We would love to hear about them below in the comments section. Hi, I'm Kimball Vaughn and I'm a Super Super Senior studying PR at BYU. During my first five years at BYU I've been an avid exercise enthusiast, chef, and adventurer.